On the 4th (Sat), stop by Amoeba Music. Get ready for a full day of sightseeing on the 5th (Sun): browse the different shops at Two Rodeo Drive, then kick back and relax at Will Rogers State Beach, then enjoy the sand and surf at Venice Beach and Boardwalk, and finally appreciate the extensive heritage of Santa Monica Pier. To see where to stay, maps, and other tourist information, you can read our Los Angeles road trip planning website . Verona, Italy to Los Angeles is an approximately 16.5-hour flight. You can also do a combination of train and flight. Traveling from Verona to Los Angeles, you'll gain 9 hours due to the time zone difference. Traveling from Verona in May, Los Angeles is somewhat warmer at night with lows of 17°C. Wrap up your sightseeing on the 6th (Mon) to allow time to travel to Yosemite National Park. 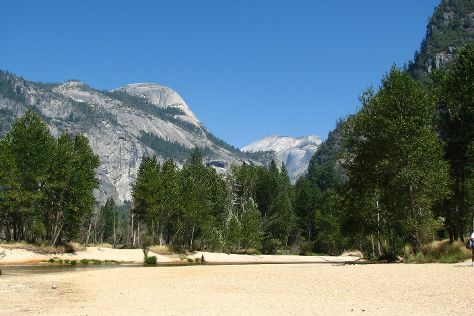 Kick off your visit on the 7th (Tue): don't miss a visit to Tuolumne Grove of Giant Sequoias, kick back and relax at Cathedral Beach Picnic Area, then get great views at Valley View, and finally trek along Lower Yosemite Fall Trail. On your second day here, take in the dramatic natural features at Glacier Point, explore the striking landscape at Taft Point, then view the masterpieces at Ansel Adams Gallery, and finally examine the collection at Yosemite Museum Gallery. To see maps, where to stay, and tourist information, refer to the Yosemite National Park sightseeing site . Getting from Los Angeles to Yosemite National Park by combination of flight and car takes about 4.5 hours. Other options: drive; or do a combination of flight and bus. Expect little chillier weather when traveling from Los Angeles in May: highs in Yosemite National Park hover around 21°C, while lows dip to 1°C. Wrap up your sightseeing on the 8th (Wed) to allow time to drive to San Francisco. Kick off your visit on the 9th (Thu): step off the mainland to explore Alcatraz Island, hunt for treasures at Ferry Plaza Farmers Market, then browse the different shops at Ferry Building Marketplace, and finally get a taste of the local shopping with Union Square. On the 10th (Fri), you'll have a packed day of sightseeing: explore and take pictures at Twin Peaks, then snap pictures at Golden Gate Bridge, then take in the waterfront at Fisherman's Wharf, and finally steep yourself in history at City Lights Booksellers. To find reviews, more things to do, photos, and tourist information, use the San Francisco road trip tool . You can drive from Yosemite National Park to San Francisco in 4 hours. Other options are to do a combination of car and flight; or do a combination of bus and flight. Traveling from Yosemite National Park in May, you can expect nighttime temperatures to be a bit warmer in San Francisco, with lows of 13°C. Wrap up your sightseeing on the 10th (Fri) early enough to travel back home.